Did you know that the Special Collections Department collects and displays a vast array of Mardi Gras costumes, ephemera, and other festive regalia from the Baton Rouge area? Our seasonal displays include photographs from some of the first parades to roll down Baton Rouge streets, throws spanning decades, and ball costumes so elaborate you’ll be in awe. All of these materials shed light on the city’s unique celebration of the Mardi Gras season. Come check out the display on the second floor of the Main Library in the Special Collections Department! Just outside our doors, you will be greeted by our lady mannequin sporting a maid’s costume worn by Ms. Jane (Francis) Ward in 1959. Ms. Ward served as one of the Queen’s maids for the Krewe of Romany— the oldest women’s Mardi Gras Krewe in Baton Rouge, created to present the debutant daughters of Krewe members. 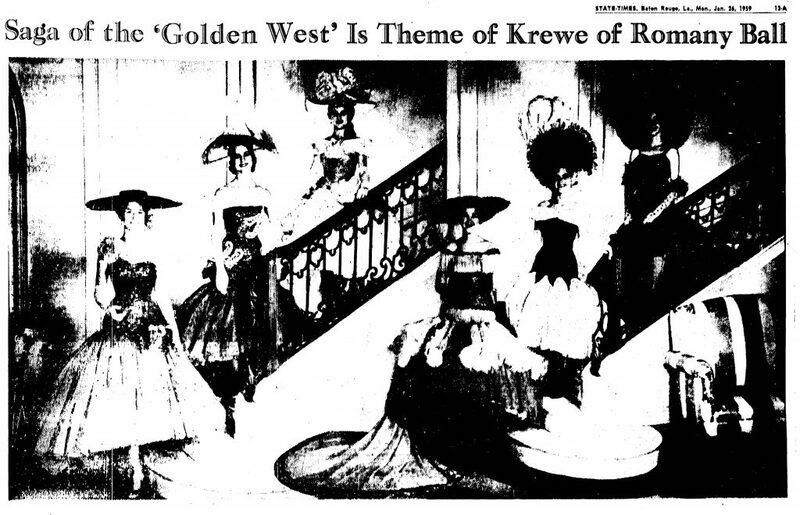 The theme for the ball in 1959 was the “Golden West.” Ms. Ward, along with many of the women involved in Krewe of Romany, remained an active member for many years. The Special Collections Department keeps images ready for anyone interested in viewing some of the other costumes worn by Ms. Ward, as well as those of other revelers. Ask an archivist to view them while you are visiting. Further into the department you will come to a case containing images from the “Fairy Tales” parade in 1951, organized and hosted by the Young Men’s Business Club (YMBC). Each float was sponsored and designed by local civic organizations that chose a specific fairy tale to represent. This was Baton Rouge’s second annual Mardi Gras parade to be followed by an awards ceremony for best float and a bal masque, both held by YMBC at the Community Club at Victory Park. These images come to us from the Baton Rouge Fire Department Collection. You can find more images on the Baton Rouge Digital Archive. There is no registration fee, and anything will do for an entry. Many entrants decorate pickup trucks. Some people pull little red wagons. A few ride bicycles. Others just walk. One man once rode his bicycle behind other floats, picking up stray beads and throwing them to bystanders. Two revelers dressed as clowns dispensed paper IOU’s for beads, tossing them like confetti. Nearly 10,000 people lined the route to watch as the parade rolled from the parking lot of the Burbank Drive Piggly Wiggly Supermarket, down GSRI Road to the Drillers Diamond. The parade had an all-star royalty lineup; Smiley Anders served as the parade captain, Price LeBlanc served as king, and Cynthia Nickerson of WBRZ-TV served as queen. Sadly, this parade only rolled for one year. Have you seen enough Mardi Gras memories? We didn’t think so. 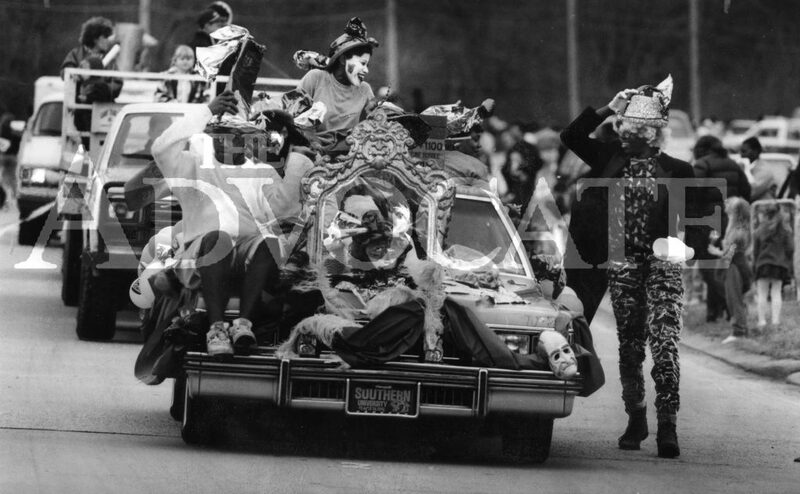 You can always check out the Baton Rouge Digital Archive for more images of the Baton Rouge Mardi Gras celebration. This year, we’ve begun crawling websites related to the celebration of Mardi Gras in Baton Rouge to make sure their history is archived, too. You will find websites created by krewes, social media pages such as Facebook event pages and Krewe profiles, news and commentary, and video posted to YouTube by parade attendees in the collection we’ve started here. So far, we’ve collected material from the Krewe of Orion, the Society for the Preservation of Lagniappe in Louisiana, the Mystic Krewe of Apollo, and more! We add new content every day and would love your help in shaping what is preserved. To learn more about the East Baton Rouge Web Archives and to submit a URL to be added to the web archive, visit the Baton Rouge Room InfoGuide.